There has never been a better time to be a small business owner in Nashville. The city is experiencing a cultural renaissance. East Nashville, especially the Five Points area, is being revamped and influenced in a big way by artists, artisans, and entrepreneurs. Old homes and buildings are being turned into boutiques, art galleries, and restaurants. It's a truly exciting time to stroll through these neighborhoods and hit all the quaint little shops in search of the perfect holiday gift. Unless you happen to be in a wheelchair, or on crutches, or use a walker. If you need any kind of mobility aid a great number of independently owned small businesses are inaccessible. Worse still, there are entire city blocks in the aforementioned neighborhoods with access ramps in such desperate need of repair, if not altogether absent, that there's no way for a wheelchair to even use the sidewalk. I have personally run into four separate circumstances in as many months in which I could not get into a specific small business because they were, and remain, completely impossible to get into if you're in a wheelchair. Two of the four owners I spoke to expressed sincere regret over the circumstances and, while I appreciate that, regret has yet to build a ramp over a set of stairs. I hate having to write this post because it reflects badly on my city. But the truth is this inaccessibility is a very subtle and entirely acceptable form of segregation. It is an unconscious assumption that hip and trendy boutique shoppers, restaurant patrons, and night-lifers are all able-bodied. It's an abdication of responsibility because the Americans with Disabilities Act doesn't mandate small businesses in older buildings be handicapped accessible. The gentrification or reinvention of older neighborhoods without modifications for the mobility impaired is matter-of-fact apartheidism in the literal sense of the term. We can't get in, so we remain apart from the community, forever pressing our noses to the glass that separates us from that business/block/neighborhood. Now I know some of you are wondering why I should even care about this given the fact that the newer construction in commercial areas and malls is accessible. I care because this is "back of the bus" rationalizing at it's finest. I care because anything that makes me or my disabled peers feel like they are "less than" anyone else demands to be pointed out and deserves to be corrected. I care because those that come after me should not feel the sting of a snub based solely on a physical limitation. And, just on a gut level, it pisses me off. It makes me lose my cool that this is the end of 2013 and we are still handling accessibility issues with the same level of awareness and consistency as a game of pin the tail on the donkey. We claim to be more conscious of our global footprint, of recycling and repurposing, of bullying and social equality. Yet when it comes to equal physical access it's either a revelation or an inconvenience when disparities are pointed out. 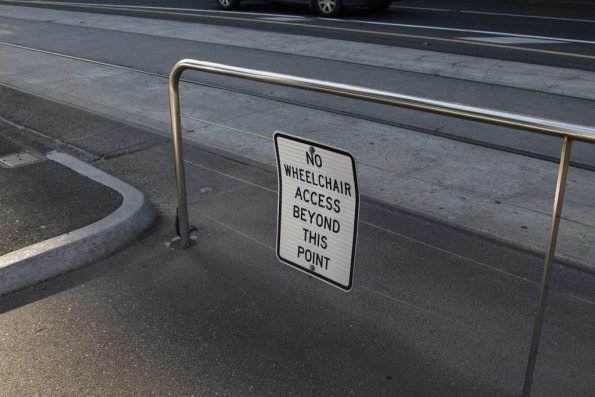 So much so that the barriers that keep the physically disabled out are being ignored instead of eliminated. We have to make it unhip, untrendy, and unprofitable to be inaccessible. But we also have to help educate small businesses as to the advantages of being accessible and the means to become so. In certain areas small businesses can get a tax credit of 50% of costs incurred in making a building accessible. If that's not enough of an enticement there are many online crowdfunding sites such as Indiegogo that would help defray some, or all, accessibility expenses. Positive, lasting change in a society only comes when a large enough number of people will publically, socially support what is right. If you're reading this I'm asking you to be one of those people. If as an able-bodied person you're wondering, "What's in it for me?" consider this. 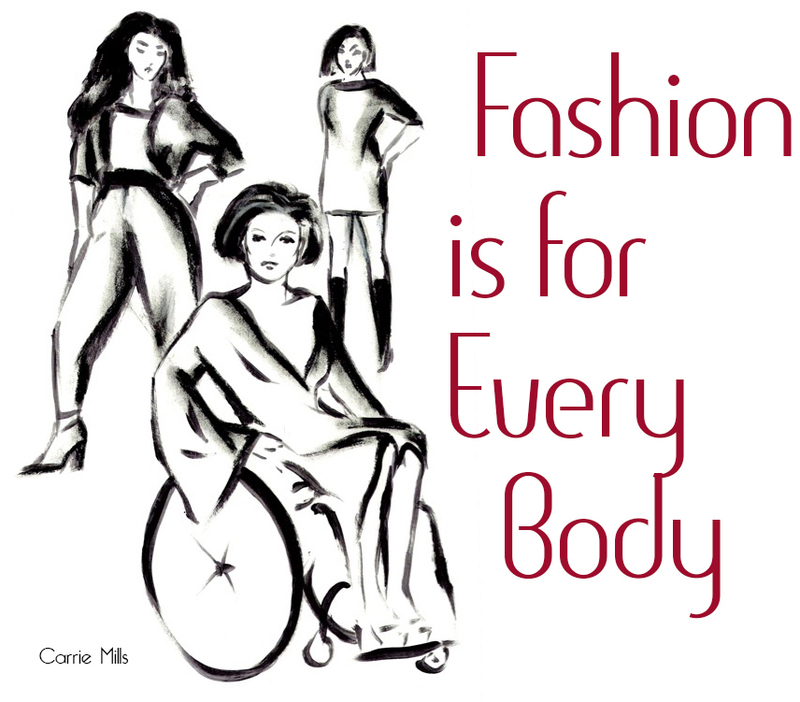 One in five people are currently physically disabled in some form or fashion. That number jumps to almost three in five after age 70. It's not a matter of if you become disabled so much as when. Mobility is a gift that is on loan to you, and very few people are fortunate enough to keep it from cradle to grave. So, you see, it's in your best interest to help fix this problem now, before you find yourself with your nose pressed against the glass, too.